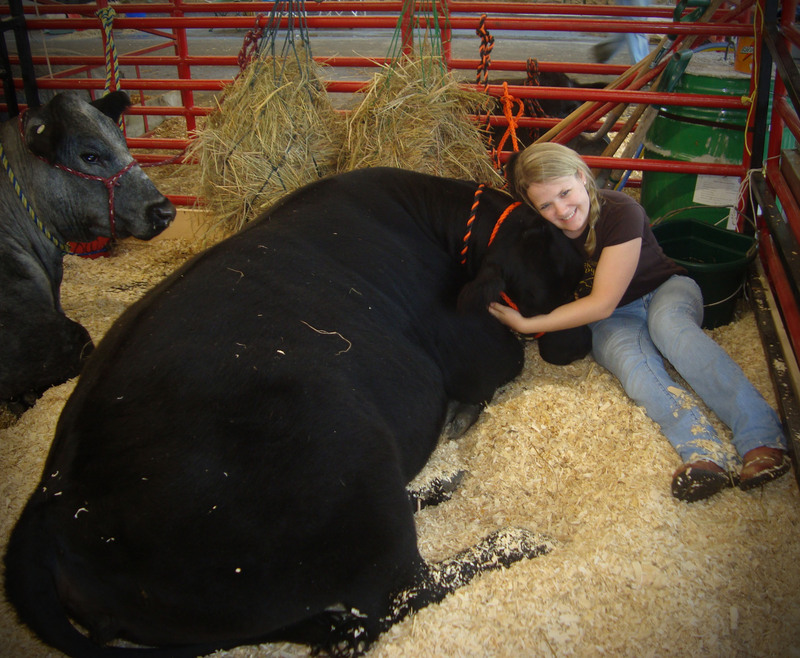 After our move to the country, a little ag knowledge, and our own show livestock, my sister and I found ourselves on the receiving side of the “can I pet your cow” question. Maybe because we understand both sides, this always thrilled the two of us. It gave us the opportunity to educate. 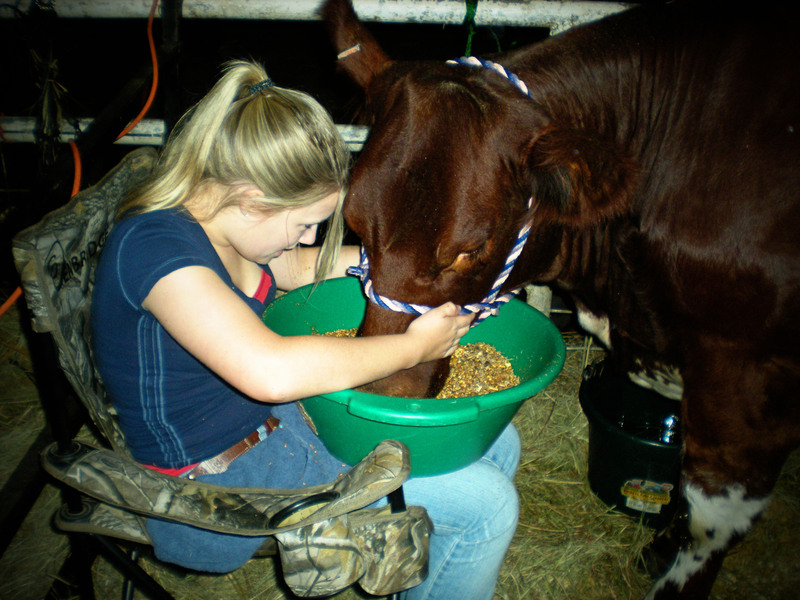 My sister, Alexis and her Shorthorn heifer Lucy. Not that either of us saw it that way then, but looking back, it’s exactly what we did. 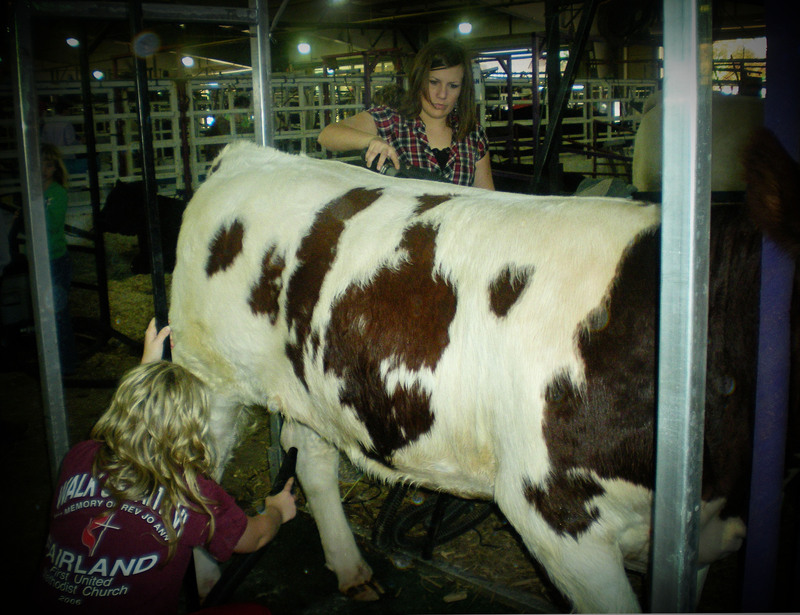 When someone would ask us if they “could pet our cows” our answer was always yes, and followed by explaining how to safely interact with cattle, talking to them about what we fed our show cattle and why, and explaining that they were in fact heifers and what exactly a heifer was. Because neither my sister or I ever liked when people would make us feel uneducated about agriculture we always incorporated our mini info sessions with personal details like our heifers names, letting people feed them, and holding children on or next to our heifers so their parents could take pictures, this usually made people feel comfortable asking us further questions. 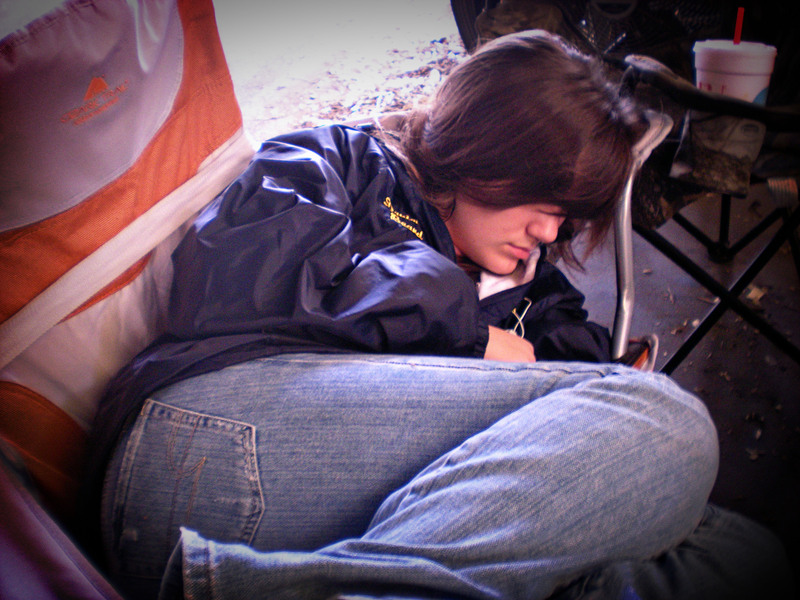 Give me a lawn chair, a barn full fans, misters, and mooing cattle and I’m out like a light. I promise it’s the best sleeping conditions ever, try it sometime. So maybe we did treat our livestock show time as a petting zoo, or maybe it comes with having the last name “Beard” and the genetic ability to have a conversation with a brick wall. My point is directed towards my friends and readers in the agriculture industry. Whether you want to be an advocate for agriculture or not, realize you are what the public sees, and it’s your job to uphold the values that go hand-in-hand with this industry. Also remember you are never to young or to old for this job. It’s easy to get caught up in what you do, but remember to take the time to drop the agriculture lingo and let someone “pet your cow” you never know what a positive impact you could be making on the rest of some small child, or even a grown adult’s life. Heifer- In cattle it is a young female that has not borne a calf. Steer- In cattle it is a male who has been castrated. An Ag Nerd’s view on dating, marriage, & babies. GREAT post Danielle! I really enjoyed it! 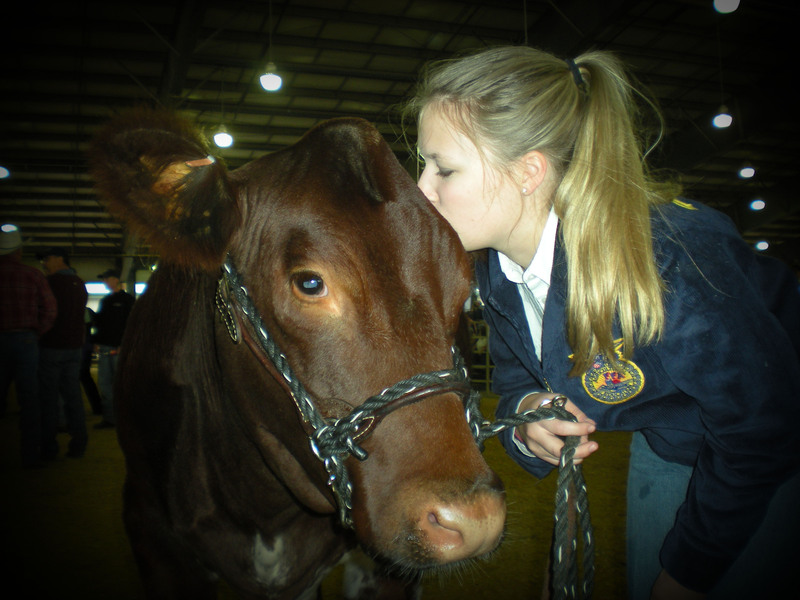 It makes me happy that you and your sister were so eager to educate the public at livestock events! Thank you Yoda, I’m glad you enjoyed it. Thank you Dad! The fact that you put (Dad) after your name cracks me up… just in case you were wondering. This is great!!!! 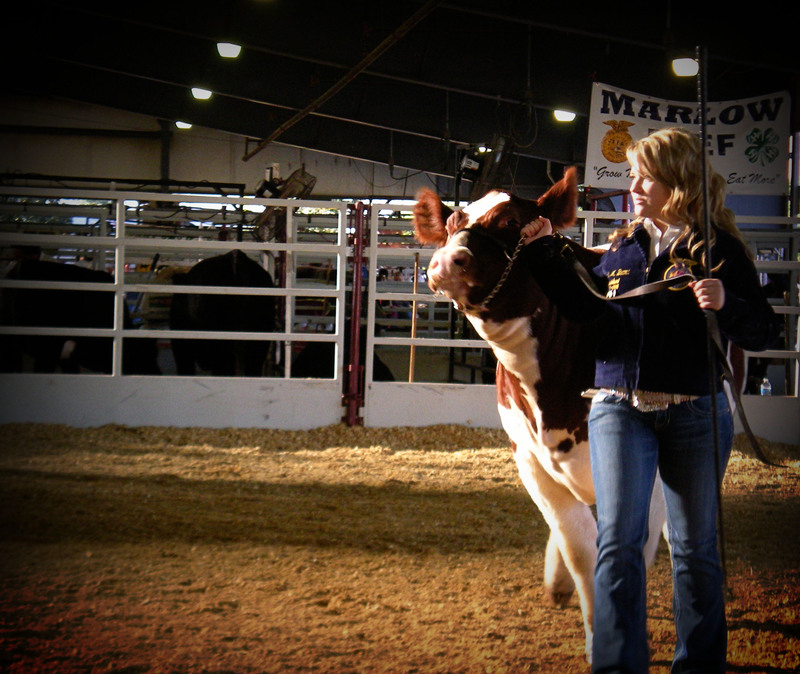 Instead of being the annoyed showman when asked “can I pet your cow,” you put into practice the main reason of a fair, connecting agriculture with the rest of the world. Thank you!! Yes, it is the main reason of the fair, and it’s easy to forget when in competition mode… but neither my sister and I were ever super competitive (there were a couple, “first from the right” shows) so unintentional PR worked out. Awww such a good post! Love ya!!! Thanks Bethany!! Love you too chicka! very good writing Danielle, kept me interested to the end, and being the suburbanite that has found hisself in the country I can totally relate to the ” can I pet youre cow ” statement, as I am the one asking, great to know that i dont come off as a complete idiot to the owner of the cow., thanks. Interesting as always. You are a natural. Looking forward to the next post. Thanks for the memories. Very nicely said! I need to share this with my current 4-Hers, including my 10 year old who will show her first calves this summer! 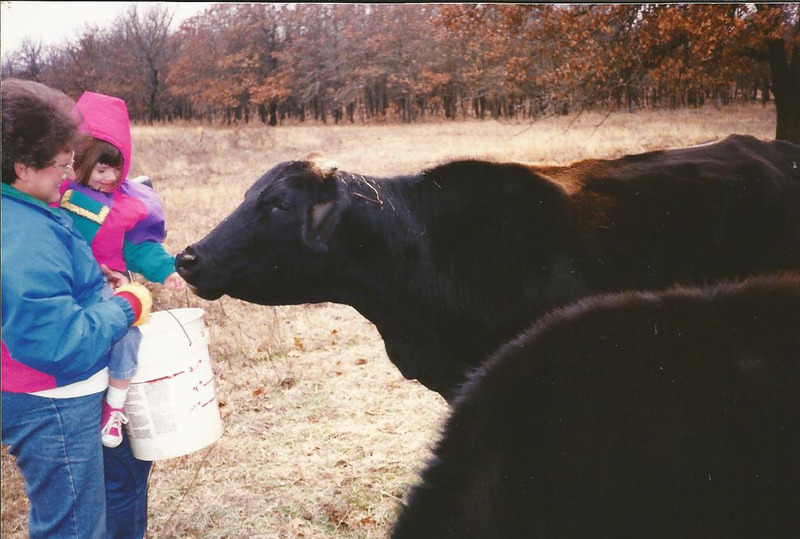 wow, I never once was annoyed when someone asked if they could pet my cow. I used the opportunity like you and your sister did. The only part that would make me lividly mad is when they would walk up and pet them without asking. Despite the amount of training we put into them, they still are large animals who can kick. And the last thing I want is anyone hating cattle because they didn’t understand the animals’ instincts and accidentally put themselves in a position to be kicked.